We have successful experience design machines according to customer’s requirement. The machine absorbing advanced technology in the world, is the new generation of the automatic filling and sealing machine. It has the characters like Omron PLC control,reasonable design, compact structure, beautiful appearance, stable and reliable performance, high filling accuracy, adaptability, simple operation, easy maintenance, cleaning and convenient. 2. automatic fill coffee powder as precise weight 3g, 5g,7g, 10g etc and press the powder tightly. 3. automatic feed foil and twice heat seal . Powder product as coffee, chocolate, tea, milk powder, sugar etc. 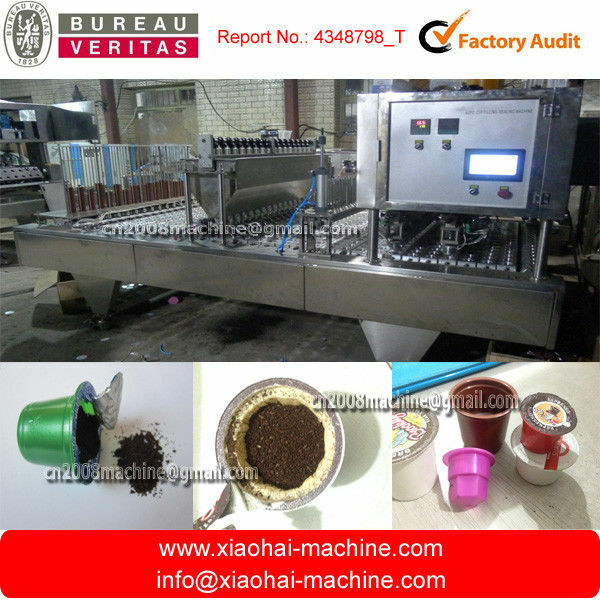 The mould of the machine for the coffee cup is made according to customers’ cup. The machine can be customized depending on your requirements. So if you have any demands, please let me know.